Build Your Own Tadpole Trike With Rear Suspension. The StreetFox is an easy to build DIY tadpole trike with rear suspension and over seat steering. 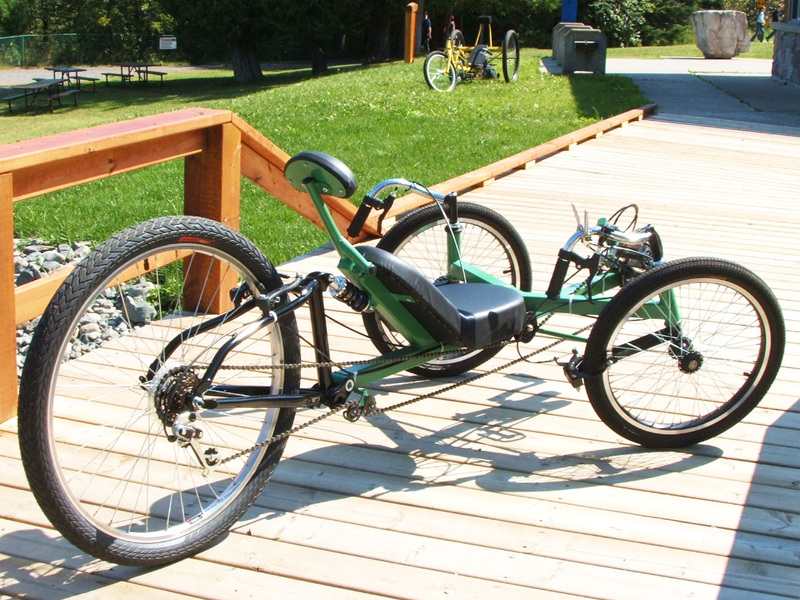 The entire trike can be built using only basic bicycle components, and there are no machined parts required. 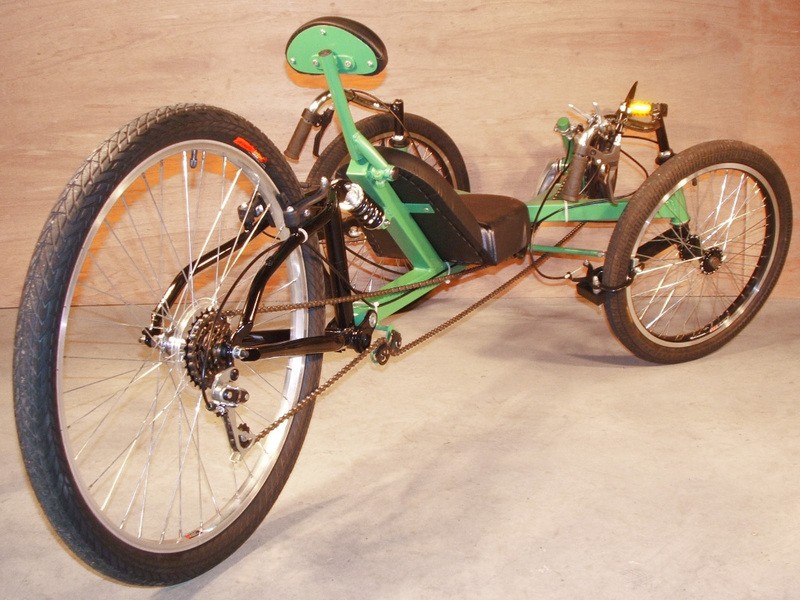 The StreetFox DIY Tadpole Trike features brakes on all wheels, 15 or more speeds, rear suspension, and an easily adjustable bottom brakcet to accomodate riders of varying leg lengths. 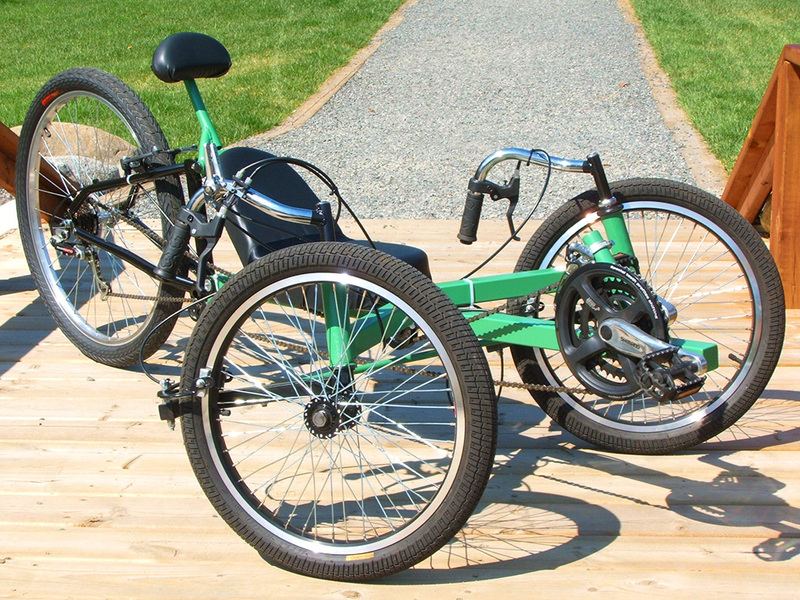 A Tadpole style trike is one with two wheels up front, and one wheel in the back, and this configuration most commonly has 20 inch wheel sin the front, with a 26 inch wheel in the rear. The 26 inch rear wheel offers a smooth ride and good high speed gear range. 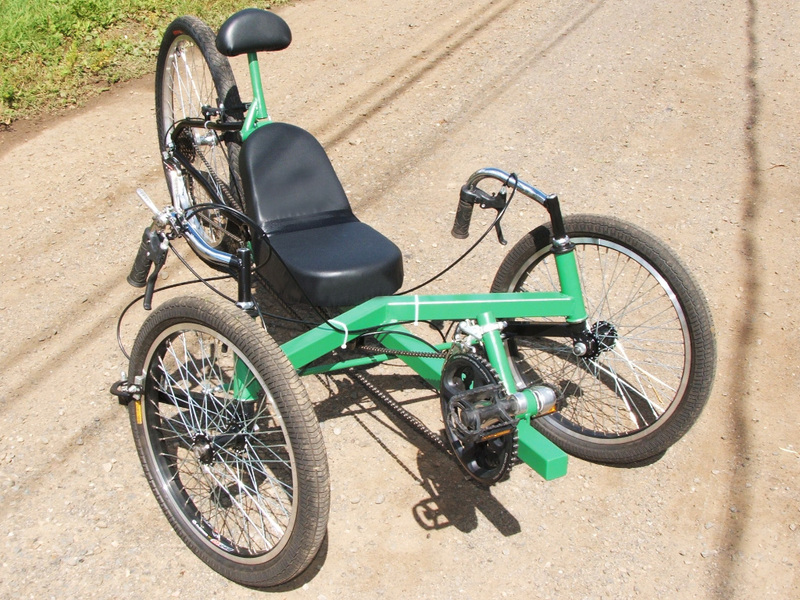 You Can Build a great Looking Trike With Minimal Tools and basic Parts. Standard bicycle components and square metal tubing. That is all you need in order to make your own DIY Tadpole Trike. For the cost of a few tanks of gas, you can be rolling out of your workshop on a trike that looks and rides like it was worth 10 times more than what it will cost you to make. The StreetFox handles really well at any speed, offers a full range of gears and has plenty of stopping power. The sliding bottom bracket allows you to reposition the cranks anywhere on the main boom so that riders of different leg lengths can easily adjust the distance between the cranks and the seat for optimal power delivery. Great For Long Haul Riding or Fast City Trips. This is an all around good trike for just about any kind of riding from long distance to city streets, and even off road. The comfortable seat with adjustable back support along with the rear suspension will make your riding experience relaxing and enjoyable. Sitting in a natural riding position allows you to enjoy your view without having to hold your head up. The the days of painful upright bicycle seats will finally be gone! You are free to add just about any kind of seat you like, from the simple DIY seat shown in the plans all the way to a car seat. Handlebar shape and position are also easly modified to create a vehicle that is perfect for your style and comfort. Did You Build That Trike? It Looks Amazing! Nothing beats the pride of claiming you built it when your are asked how much you paid and where you bought it from. With a little hard work, you can build your own amazing DIY Tadpole Trike in a few weekends, and it won't cost you much. Our plans are designed for anyone, so you do not have to be an experienced bike builder in order to build a trike just like this, and you can do it with very basic tools. We have designed the steering components to be very easy to build using only standard bicycle components and some small pieces of steel tubing. There are no machined parts, and everything can be done by a begginner in a basic workshop. Drive Off Road and Take on Long Steep Hills. 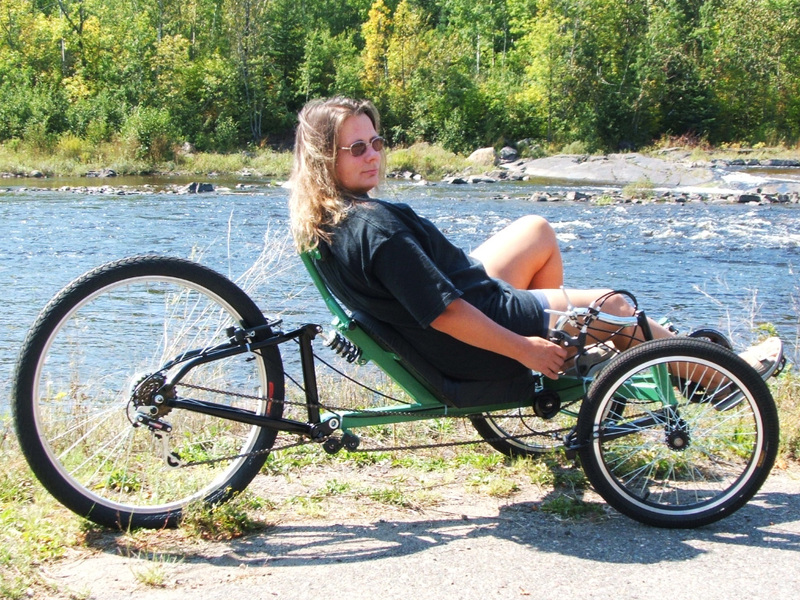 Recumbent trikes are great hill climbers. Just drop into low gear, and crank away at your own pace with no risk of falling over. The robust rear suspension is made from a salvaged mountain bike, so it can handle rough roads, potholes, gravel, and off road trails with ease. The short wheelbase of a tadpole trike makes it easy to control on a crowded street or bike path, and you can turn around easily in half the width of a city street. Like all of our DIY Bike and Trike Plans, there is always plenty of room for your own modifications and to use the parts you already have on hand. One scrap mountain bike, some steel tubing, and a few other standard bicycle components make up most of the build. 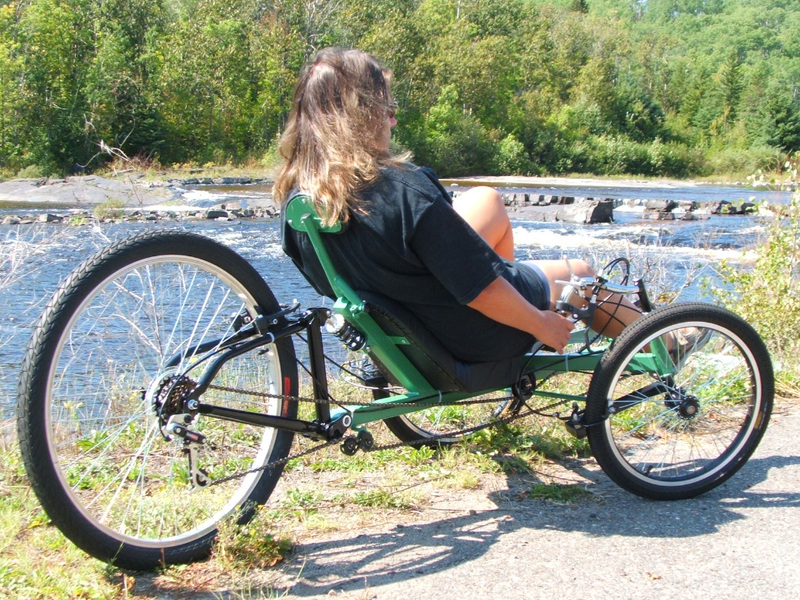 This Trike is Easily Adjustable to Other Riders. The cranks can be set anyplace on the main boom for riders of varying leg lengths using only a wrench. The seat includes an adjustable back support that can be set at any angle. You can also install a fully adjustable seat during your build if you like. Handlebars can also be adjusted just like standard bicycle handlebars, including the angle and position of all levers and shifters for the most ergonomic reach. Tadpole Trike steering is not difficult to build for anyone, and our DIY plan shows every single step in a way that makes it much easier to understand. 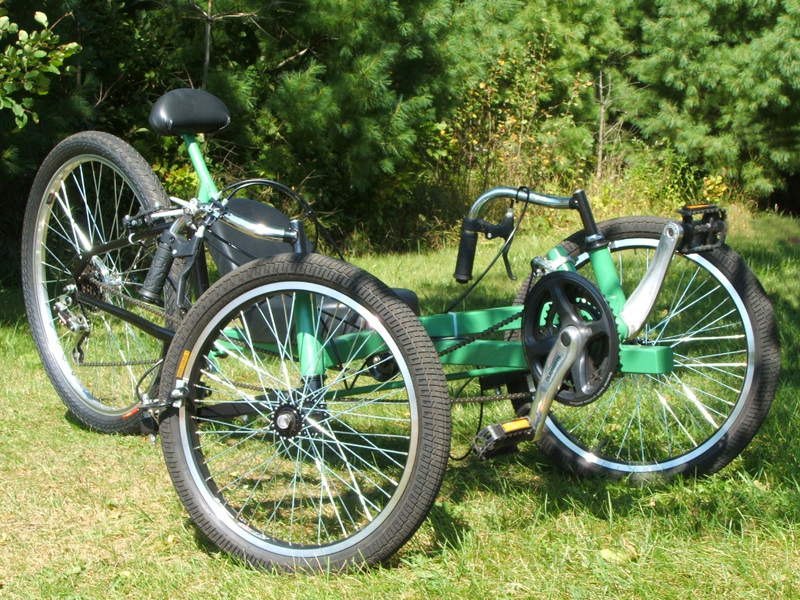 When you are done, you will be able to transfer your skills to other trike building projects you may do. Large Rear Wheel For Optimal Speed and Comfort. Using a full size 26 inch rear wheel means that you will have the expected full range of gears you are used to on a regular bicycle. This standard sized rim also offers the largest selection of tires, so you can go fat for off roading, or skinny high pressure for fast road running. The rear sprocket cluster is also changeable so you could add a massive low range gear for ultimate off roading and climbing ability if required. The entire rear suspension frame is taken directly from a mountain bike, so all standard bicycle components such as brakes, derailleurs and even a luggage rack can be added easily. You can use caliper brakes or a rear disc brake as well. Build Your Own Human Powerd Vehicle. When you decide to take your trike instead of the car, you save money, keep healthy, and just have a much better time! Touring on a suspension tadpole trike is also a great experience, and you have the benefit of so much more cargo carrying capacity. If you have been dreaming of owning your own tadpole trike, then why not save a bundle and just build it yourself? It's a fun and rewarding experience for anyone. Because there are no machined parts required, anyone with an angle grinder, hand drill and basic welder can follow this DIY Trike Plan and create a smooth riding and great looking trike on a minimal budget. Let's get building!